Filmed completely on an iPhone 7 Pro - is it up to the task? We only had an hour with the faceliftedAlfa Romeo MiTo, but that hour was packed with about as much fun as you can have in a car in 60 minutes. We were invited to the aircraft hangarby Alfa, to learn some car control, and create some artwork in the process. To make things even more exciting and interesting, everything would be filmed on the iPhone 7 Plus, to see how Apple's new smartphone can cope in challenging environments. 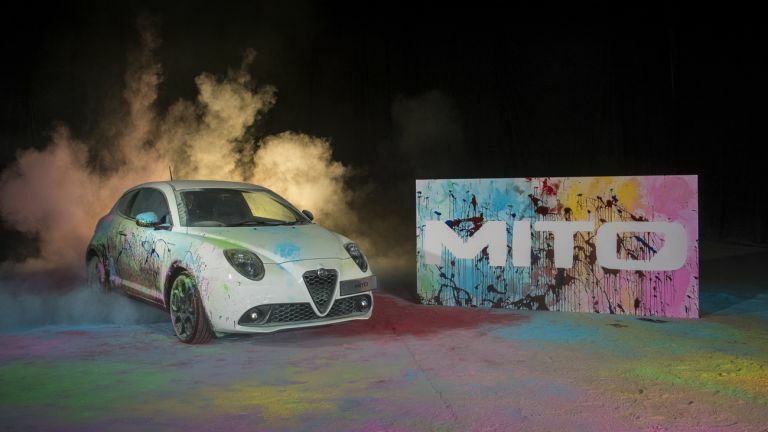 We hopped in the range-topping MiTo Veloce, which is powered by the 1.4 MultiAir 170hp petrol engine with ALFA TCT transmission (and steering wheel-mounted gearshift paddles). It's a little pocket rocket, capable of reaching 62mph in 7.3 seconds and a top speed of 136mph.It also featuresAlfa's DNA driving mode selector (which we first tested in the awesome Alfa Romeo 4C Spyder), which allows you to choose between Natural for relaxed driving, Dynamic for more spirited stuff, and All-Weather mode to keep you safe. We started by driving over some large mounds of colourful powder. As you'll see in the video, despite being very low light, the iPhone 7 Pro performed quite well, although, it did struggle with the fast movement of the car. After kicking up a metric tonne of powder, we could no longer see where we were going. Time for a break and switch to the next activity - handbrake turns. Now, I've never done a handbrake turn beforebut it turns out, it's actually pretty easy - especially if you have a pro driver telling youexactly what to do, and the floor is covered in gallons of wet paint. Here's what Ben Treston, Lead Camera Operator had to say about working with the iPhone 7. It was a great technical challenge using the iPhone 7 Plus as our only camera on this shoot, especially in a low light environment - we were amazed by the quality of colour we were able to capture. We used the Filmic Pro app which helped us have additional control over the camera. Being able to switch lenses on the iPhone 7 Plus was a great help when shooting the action shots of the car. Using some off-the-shelf tripod mounts with the iPhones means we could use all of our existing camera systems for bolting onto the car, shoulder rigs and using stabilised gimbals. After filming, with my newly found talents, I took my personal car to my local McDonald's car park, and accidently rolled it onto its roof. DO NOT TRY THIS AT HOME. The Alfa Romeo starts at £12,960 OTR, and rises to £20,500 for the Veloce model. Or maybe the best electric cars are more up your street?